Shoshone Falls, sometimes referred to as “Niagara of the West,” is nearly 1,000 feet wide and, at 212 feet high, 45 feet taller than Niagara Falls. The quantity of water flowing over the rim can reach up to 20,000 cubic feet per second, and, while I don't know the volume of water that was flowing when I took this photo, it seemed quite high – high enough, in fact, to generate enough mist to create not one, but two rainbows, seen on the left side of this photo! Available in the following sizes (Panorama B): 30x12, 40x16, 50x20, 50x20 Triptych (3 x 17x20), 60x24, 60x24 Triptych (3 x 20x24), 75x30, 75x30 Triptych (3 x 25x30), 90x36, 90x36 Triptych (3 x 30x36), 105x42 Triptych (3 x 35x42), 120x48 Triptych (3 x 40x48). 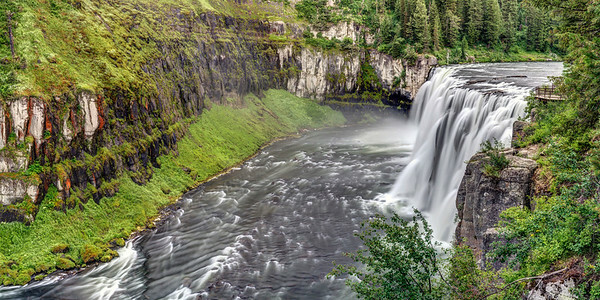 Upper Mesa Falls, in southern Idaho, is stunning, and, since it is in the middle of nowhere, the crowds tend to be minimal. At 114 feet tall and roughly 200 feet wide, it is truly a sight to see! I took this photo on a quick trip through Southern Idaho, but it left me yearning to return and spend some more time in this beautiful and rugged state. Available in the following sizes (Panorama A): 20x10, 24x12, 32x16, 40x20, 48x24, 48x24 Triptych (3 x 16x24), 60x30, 60x30 Triptych (3 x 20x30), 72x36, 72x36 Triptych (3 x 24x36), 80x40, 80x40 Triptych (3 x 27x40), 96x48, 96x48 Triptych (3 x 32x48).